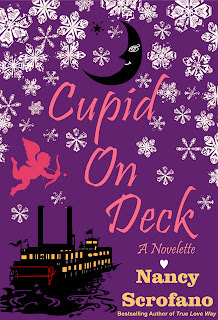 Nancy Scrofano's latest read, Cupid on Deck, is an incredibly romantic novelette. If you loved Nancy's debut, True Love Way, then you'll feel right at home! Lou is another fun heroine with a passion for the past. Dressed as flappers, Lou and her best friend Meg are spending Valentine's Day on a 1920's theme cruise, dancing and romance in their sights. Meg's on a date with her boyfriend Max and to keep Lou from feeling like a third wheel he's arranged for his cousin, Nate, to be her date. Lou's had a crush on Nate since she first met him, and she finally has the chance to make her move and show him how she feels. The night doesn't begin so well, though, when Nate shows up with his own date and Lou, sweet,single Lou, is left surrounded by lovey-dovey couples. Then, a dashing hero, Landon Harper, makes his way over to Lou and the romance begins in earnest. Cupid on Deck is just the right length to put readers in a romantic mind frame. It's a quick read, but I felt like I really got to know Lou and Landon, so rooting for them became a natural occurrence. Nancy's style will be familiar to fans, but also distinguishable. I love that she can remain true to her signature style, but entertain us with something different that her last novel. Cupid on Deck is a light, chick-lit read with a little humor added to the mix. I loved True Love Way, her first full length novel, and I'm a big fan of Nancy's, but I'm looking forward to more of her novelette length reads!